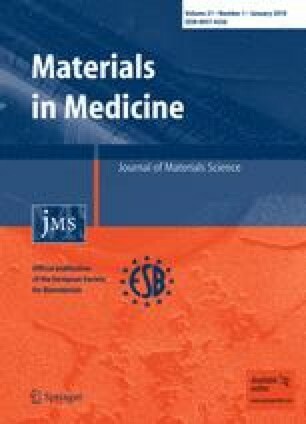 The purpose of the study presented in this paper has been to examine the possibility of the synthesis of a new nanoparticulate system for controlled and systemic drug delivery with double effect. In the first step, a drug is released from bioresorbable polymer; in the second stage, after resorption of the polymer, non-bioresorbable calcium phosphate remains the chief part of the particle and takes the role of a filler, filling a bone defect. The obtained tigecycline-loaded calcium-phosphate(CP)/poly(dl-lactide-co-glycolide)(PLGA) nanoparticles contain calcium phosphate coated with bioresorbable polymer. The composite was analyzed by FT-IR, XRD and AFM methods. The average particle size of the nanocomposite ranges between 65 and 95 nm. Release profiles of tigecycline were obtained by UV–VIS spectroscopy in physiological solution at 37°C. Experimental results were analyzed using Peppas and Weibull mathematical models. Based on kinetic parameters, tigecycline release was defined as non-Fickian transport. The cytotoxicity of the nanocomposite was examined on standard cell lines of MC3T3-E1, in vitro. The obtained low values of lactate dehydrogenase (LDH) activity (under 37%) indicate low cytotoxicity level. The behaviour of the composite under real-life conditions was analyzed through implantation of the nanocomposite into living organisms, in vivo. The system with the lowest tigecycline content proved to be an adequate system for local and controlled release. Having in mind the registered antibiotics concentration in other tissues, delivery systems with a higher tigecycline content show both local and systemic effects. This study was supported by the Ministry of Science and Technological Development of the Republic of Serbia, under Grant No. 142006: Synthesis of functional materials with controlled structure on molecular and nano- levels. The authors would like to thank to Dr. D. Vasiljevic-Radovic for AFM analysis, Dr. M. Mitric for his kind help help in X ray measurements and Dr. M. Dramicanin for DLS analysis. The study is a result of joint research carried out by the Department of Biomaterials, Faculty of Dentistry, University of Oslo, under the guidance of Prof. Dr. Petter Lyngstadaas and Institute of Technical Sciences of the Serbian Academy of Sciences and Arts.